Are you sick and tired of having to hide your legs behind leggings, tights or pants because of spider veins? Do you love to wear shorts to exercise or play, but feel too embarrassed by lots of purple and red spider veins? If so, we are here to help you get rid of those pesky veins and get you back to loving your legs again! Because each person is unique and the reasons we get spider veins are varied, there really isn’t a one-size-fits-all approach to treatment. Celibre Medical Corporation proudly offers the two best fixes in the industry to help our patients get rid of spider veins: sclerotherapy and laser spider vein removal. Sclerotherapy involves a needle that’s used to inject a solution into the unwanted blood vessel that causes it to harden and eventually dissolve away. It’s a sure thing for those larger to medium sized dilated veins. It definitely works, and because it can be so effective, we will often recommend and perform sclerotherapy for some of our patients who need treatment for larger, ugly spider veins. But for a lot of patients, sclerotherapy isn’t the only treatment needed. If you think of the venous system in our legs like connected channels of water, the larger to medium sized veins are like rivers. These will feed smaller channels like creeks and streams. Medium to small sized veins are like these. Laser treatment is ideal for vessels like this. Think of it this way: sclerotherapy shuts down the larger “feeder” vessels. This will actually enhance the effectiveness of the laser treatment, since the blood in these smaller vessels has nowhere else to retreat to! The combination of sclerotherapy and laser treatment is the perfect one-two punch to get your legs back to looking good again. Don’t spend another minute worrying about embarrassing spider veins! Treating them is faster, easier and more effective than ever. At Celibre, we are proud to offer sclerotherapy and laser removal of spider veins to almost anyone who’s looking to get back glorious-looking gams. If you thought you’d just have to live with your spider veins – think again! Why Do I Get Spider Veins in the First Place? Spider veins on our legs are sort of the “tip of the iceberg” type process that outwardly shows is happening in our deeper leg veins, which is otherwise unseen. Our leg veins are designed to take blood back up to the heart by using a series of valves that channel the blood in a one-way direction. When some of these valves fail, the blood starts moving back in the wrong direction; this causes the small surface veins to dilate with blood making them visible as blue, purple or reddish vessels or mats of fine vessels. Some factors such as weight, pregnancy, blood pressure and overall general health can contribute to developing faulty valves. Unfortunately though, most of the time, the tendency to have bad valves comes down to your genes…thanks, Mom and Dad! You may be wondering if getting rid of spider veins is dangerous or harmful to the venous system of the legs. Rest assured, it isn’t. These tiny surface vessels are just a miniscule fraction of the very large roadmap of blood vessels that are all interconnected and working together to return blood back up to the lungs and heart. Even if you knock out a significant number of them, your blood just gets re-routed through the vessels that remain. How Do Sclerotherapy and Lasers Treat Spider Veins? Sclerotherapy is a method that’s been used for decades to get rid of unwanted spider veins. It involves the use of a very fine needle that injects a solution into the unwanted blood vessel. The solution causes it to harden and eventually dissolve away. Many advances have been made in the field of sclerotherapy. At Celibre Medical Corporation, we treat our sclerotherapy patients with a solution called Asclera. Asclera is an FDA approved prescription for sclerotherapy injection, and our patients tell us it is a very comfortable treatment. Once we’ve knocked out the larger to medium sized feeder veins, we can go after those smaller, finer vessels with one of our FDA approved lasers. These target the blood that fills the tiny spider veins. No needles are necessary with the lasers, and treatments are only mildly uncomfortable. The heat generated by the laser is targeted and absorbed by the blood in the vessel, which damages it, causing it to harden then dissolve away over time. 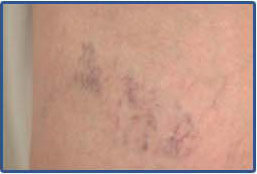 Laser treatments for spider veins offers us a great way to treat those really fine blood vessels or mats of spider veins. Because they are so small, it’s really hard to treat them with traditional sclerotherapy. No matter how fine a needle that’s used, it can be really difficult to get the solution into those tiny structures. With laser, the energy is selectively absorbed by the blood vessels…no matter how tiny they are! Most of the time, you’ll see improvement in your spider veins after just one treatment with either sclerotherapy or laser! To achieve your best looking legs, a series of sclerotherapy treatments will be likely. These can usually be spaced out one to two months. With the laser, one to five treatments may be necessary depending on the extent of your spider veins, your skin type and texture. These are usually spaced apart by about six weeks. Because it involves the use of a needle, you may look a little bruised after treatment. If you have a darker skin tone, there is one side effect that can happen after injections. Dark areas known as hemosiderin staining can occur after injections. It is a brownish discoloration that can be left behind. It can be frustrating to get rid of, but thankfully, lasers are up to the task. Yes, that’s correct. 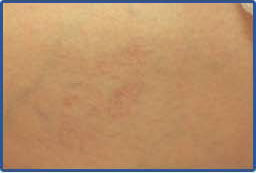 You can very effectively treat hemosiderin staining with lasers that target excess pigmentation. While no one ever intends for this side effect to occur, you have extra peace of mind at Celibre Medical Corporation, as we are well equipped to handle it! What About the Veins on my Face and Hands? So, all of this talk about good-looking legs has you wondering about other areas too? You’re in luck, because we can help you with almost any unwanted vein or vascular lesion anywhere on your body! For dilated veins on the face, laser treatment is usually the go-to. It works extremely well, usually in only one to three treatment sessions, and there is virtually no downtime at all. You can even apply makeup on your way out the door after treatment! The backs of our hands can really age us quick! As we get older, our hands start to look hollow, which makes our veins and tendons more prominent. You remember your Mom’s hands, don’t you? Well, thankfully, you don’t have to turn into Mom just yet. We can actually use sclerotherapy to treat some of those veins, and when used in combination with a dermal filler product, such as Radiesse, we can recreate lost volume. The results are amazing and they can literally turn back the clock on aging hands. At Celibre Medical Corporation, we are here to listen to all of your concerns about your unwanted spider veins. Each of our patients is unique; we understand this and carefully consider all these factors when planning your spider vein treatment. We pride ourselves with being at the forefront of the treatment of spider veins. By expertly performing both sclerotherapy and laser removal of unwanted spider veins, we truly can offer our patients a complete spectrum of effective treatments. We’d love to be your first choice to help you get rid of your embarrassing spider veins. Give us a call today and come in to meet our fantastic providers who can get your legs summer-ready in no time! Contact us today to schedule a FREE Spider Vein Removal consultation!